The Maya built with limestone and lime plasters. As the abandoned buildings disintegrate, chemicals from the stones seep into the soil, keeping some plants from growing around the structures and affecting the chemistry of those that do grow. The satellite can spot these differences and the result is a virtual road map of the buried structures from nearly 400 miles above Earth's surface. Asking the locals would have been easier, quicker, and less expensive but then they wouldn't be able to claim they "discovered" something that was never lost. I’ll call B.S. on that line. Local deforestation, no matter how severe is not going to change the pattern of rainfal in Central America. Droughts are caused by changes in the water vapor weather patterns of the globe which are causedby... THE SUN, not Kinich and his stone axe. Duh - wouldn't this be more significant than CO2? Besides, according to the upcoming movie, professor Jones and son already unearthed the Crystal Skull from there in the late fifties. Out of curiosity, the article only mentions “for 1,000 yrs” what time frame did these buildings come into existence? LOL! I once met a man who craved membership in the Explorers Club. He had to make a genuine discovery, so he packed off to Guatemala, hired a guide, drove to the most remote area and started asking around about ruins. He was finally steered to some vine encrusted mounds deep in the jungle, documented the find, and was accepted into the brotherhood. Cartography, GIS, GPS, and various remote sensing (overhead imagery) techniques are some of my primary research tools in archaeology. We are, at present, trying to arrange a LIDAR overflight over a heavily forested area where we know a complex of 30 large Caddo dwelling mounds surrounding one "big (temple?) mound" are located. LIDAR is claimed to produce elevation images with as good as 2" (two inch!) vertical resolution. It produces an "elevation point cloud" -- with points returned off of the tops of the trees, and a lower set where the laser light penetrates through the vegetation to the ground surface. By subtracting out the canopy-top point set, an amazingly detailed elevation dataset can be produced. Then, by applying pseudo-shadowing convolutions (spatial filters), a strikingly realistic and detailed "3-D" ground surface image can be generated. Or they could have started at the tourist areas of the Mayan pyramids! My Mother goes down there twice a year on medical missions with her Church group. They went to see them, and they are commonly known down there, more so than our Mt. Rushmore! This was confirmed when the writings of the venerable Mayan weatherman, Tonto Algore, were recently deciphered. Yep, that is one of the later maps in my collection. 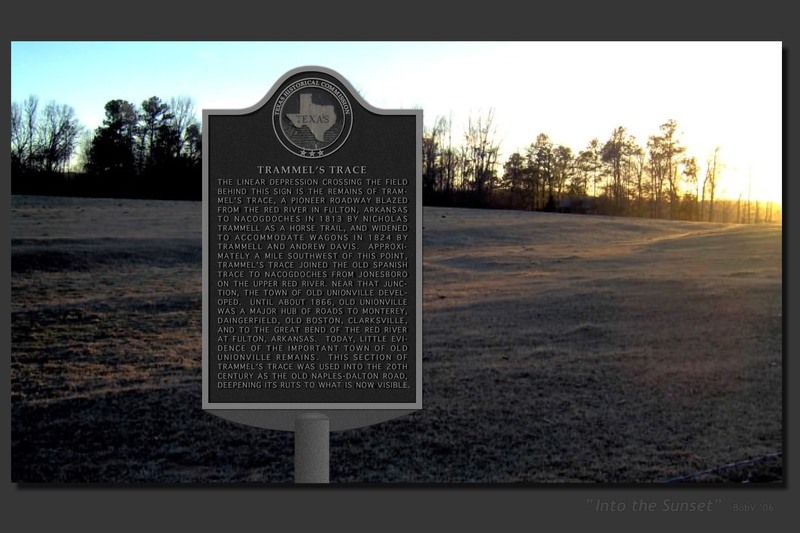 Road #22 (the Jonesboro-Nacogdoches Road or "Spanish Trace") was an early Spanish/Mexican route. In 1813, Nick Trammel cleared his "Trace" (road #42) from the Great Bend of the Red River at Fulton, AR to join with the "Spanish Trace" in northwestern Cass County Texas (where I live). 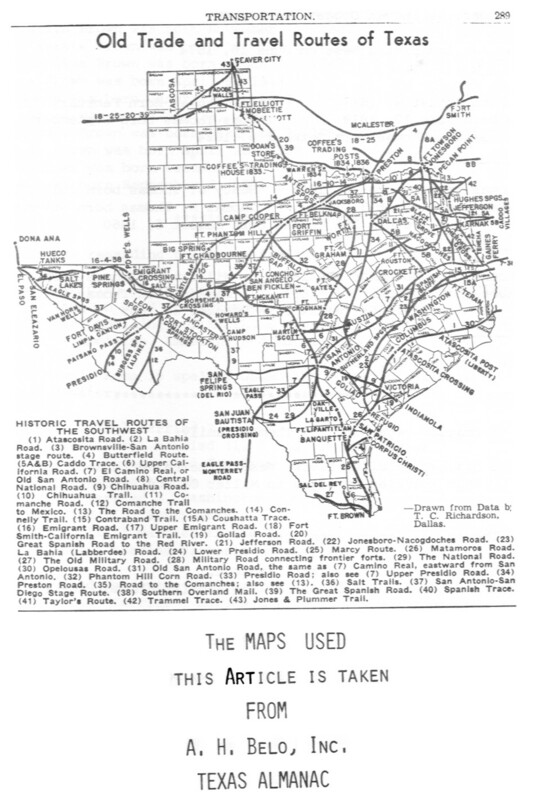 Trammel also improved the Spanish Trace on down to Nacogdoches, so the entire 180 mile Fulton to Nacogdoches route today is known as "Trammel's Trace". I focused my research on locating the "Wye" or "Y" where the traces joined. When I did so, I found that it was at the site of a town -- that vanished in 1866 -- which was a nexus of several important very early roads. We are planning a detailed on-the-ground archaeological survey of the "Old Unionville" townsite later this month. The buildings were built anywhere from about 600 AD to 1000 AD before the Mayan empire collapsed. I worked on the outer-area search project at Tikal for a few weeks and we found worker settlements (usually 3-6 house mounds and a chultun (storage area underground). We did it the old way. Used Mayan and Mexican Indians to bush out the old oil prospectors trails and then went off about 50 meters on each side of the trail, recorded what we found, and then moved on outward about 20 clicks. We did find one small temple (and a handful of baby scorpions). July 1966. Never use an American machete in a jungle. Go with the longer Philippino ones. Won’t take your foot off.